I am now one third of the way towards completing this tour. Minute Maid Park has always been one of my favorites to watch on TV. From the hill in center field to the ridiculously short left field porch this is one of the most unique parks in the country. I have wanted to see it live and was not disappointed. The Astros jumping over to the American League and making way for Interleague games everyday reeked havoc on my schedule making, but coming to this stadium washed away any ill feelings I had brewing towards the organization. Although for the third time I must ask...where is the sky? It was a muggy day out in Houston today, but once again I must say that there was no need for the roof to be closed. I asked an employee of the park what the rules were for opening and closing the roof and was told the following. In Houston they have a 65-85 rule. If the weather is below 65 degrees or above 85 they close the roof. The official Major League Baseball policy states that the roof is only allowed to be moved once during during actual game play. If the roof is closed to begin the game, it can be opened, but not closed again. About an hour into the game the weather outside had dipped below 85 degrees, however the roof remained closed just in case any rain was on the horizon, which it was not. You may be able to sense my frustration mounting as I continue to watch professional baseball with a roof over my head and the air conditioning blasting. One of the ushers at the stadium proudly told me that Houston is the most air conditioned city in the world. I understand that these men and women have to work at the stadium 81 times a year and that I am just here for one night; but the experience of going to a baseball game is fundamentally altered if you do not have at least a little part of the sun in your eyes. Like Miami, Houston is a team that is rebuilding. Unlike Miami, the stadium is still fun even without a winning team. As I wandered around I came across the Home Run Pump (a holdover from the days when Enron served as the stadium's namesake) which tracks how many home runs have been hit by the Astros since the park opened in 2000. They added one to the total during today's game. 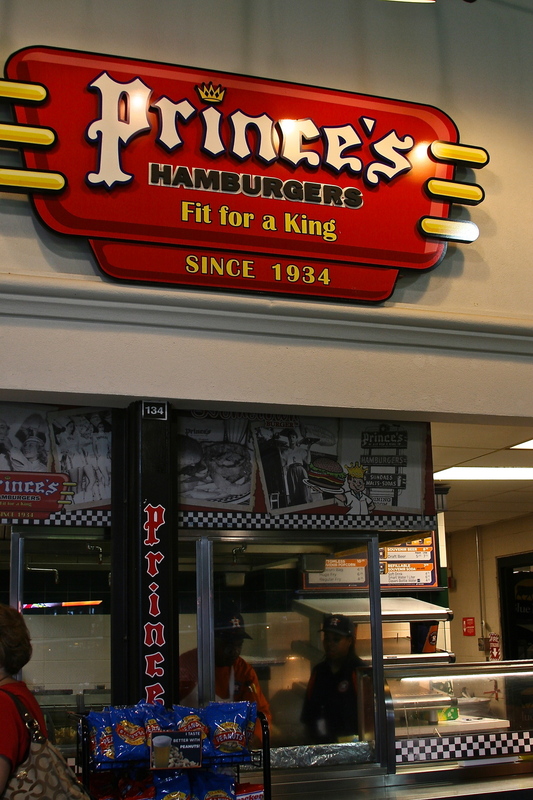 There are plenty of amazing food options, but I settled on a hamburger from Prince's Hamburgers. I looked at my notes after the game and just saw one word highlighted: "Unbelievable". I may buy a future ticket to a game in Houston just to eat another one of these burgers. I have not written too much about it, but another ritual of mine is to buy an ice cream helmet at each stadium for my collection. The ice cream has been rather pedestrian at most of the parks, but I am officially a convert to the Blue Bell brand of ice cream. I got a cookies n' cream helmet and almost went back for seconds. I have not weighed myself in a month, but I am pretty sure this food is going to kill me. The Astros were hosting the St. Louis Cardinals for today's game. In the past this would have been a rivalry game, but with the Astros fleeing the NL Central Division in favor of the American League West this was simply just another Interleague game on my schedule. I will not get into my issues with Interleague play right now, but hopefully you can read my tone that I am a bit annoyed with the inclusion of AL/NL match-ups every day of the season. Even though this was not a rivalry game, the crowd of just under 20,000 was filled with Cardinals fans. At a certain point I forgot that I was in Houston as the “Let's go Cards” chants filled the stadium. To be fair, the chants did not begin until the fourth inning at which point Astros starter Lucas Harrell gave up seven runs, but as the game progressed I noticed more and more fans of the Redbirds filing into the stadium dwarfing the Astros fans in attendance. My seatmates for this game were mainly Cardinals fans so I had to search to find some fans of the home team to talk to. I ended up meeting a family whose patriarch was originally from Detroit, but who is now an Astros season ticket holder residing in Houston to give me some insight into what the Astros mean to the Houston community. There was a scary moment when Astros right-fielder Justin Maxwell dove for a line drive and bounced his face off of the grass. He remained face down for several minutes as the trainers came out and checked him out. He was eventually taken out of the game. I wish him a speedy recovery as it is never fun to see a player come of the field due to injury. The game was a blow-out. After scoring seven runs in the fourth the Cardinals continued to dominate throughout the game. The Astros attempted to claw their way back in scoring four in the sixth, but the Cards offense proved to be too much. Even in a one sided game like this one I enjoyed my time at the stadium. I would be remiss if I did not bring up my disappointment in the employees of the park. When I come to the stadium I often like to speak with guest services, ushers, vendors and anyone else associated with the teams. For the most part I have met some very nice people who have been very helpful. This was the first stadium where I started to get a bit frustrated with the lack of information I received from those on the Astros payroll. I do not know if I simply caught all of them on a bad day, or if they simply did not like the look of me, but not one employee at the park was able to give me any information about the stadium that I did not already possess. In addition they were fairly dismissive of my inquiries as to what would be fun to do there and where I should eat. I keep comparing this city to Tampa and Miami because all three teams have been drawing a similar size fan base for years. I got the sense that Tampa and Miami were at least trying new things to fill their seats and give everybody a good time. In Houston all I really heard were complaints about the weather and the poor showing of the team on the field. The train above right field is now blocked by obtrusive and clunky advertisements that completely obscure it as it chugs along the tracks. I am not sure why the ownership in Houston thought this was a good idea, but it completely ruins the experience of watching the train go by after an Astros home run. I do not want to end this on a negative note so I will say that the few true Astros fans that I did meet were encouraging. There was a patience from a fan base just seven years removed from their last pennant. The next couple of years are going to be a rough transition for the people of Houston, but I have faith that they will be back in the mix soon. Despite the fact that the employees were not the most helpful, the park itself is beautiful on its own. 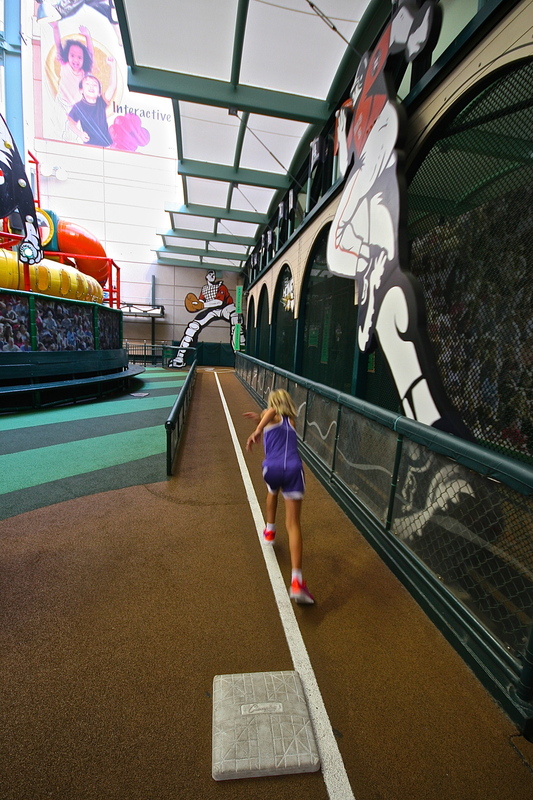 There are great areas for the kids and the novelty of the field has not worn off. Once the Astros get used to the American League, the victories will follow. With a couple of more entries in the win column I am confident that the fans will come back. In the meantime it would be nice if they kept the roof open every once in a while.